Friends Of Boston Bomber Sentenced For 'Impeding Investigation' : The Two-Way Azamat Tazhayakov was convicted of conspiracy and obstruction of justice for helping get rid of Dzhokhar Tsarnaev's backpack. Robel Phillipos was convicted of lying to the FBI. 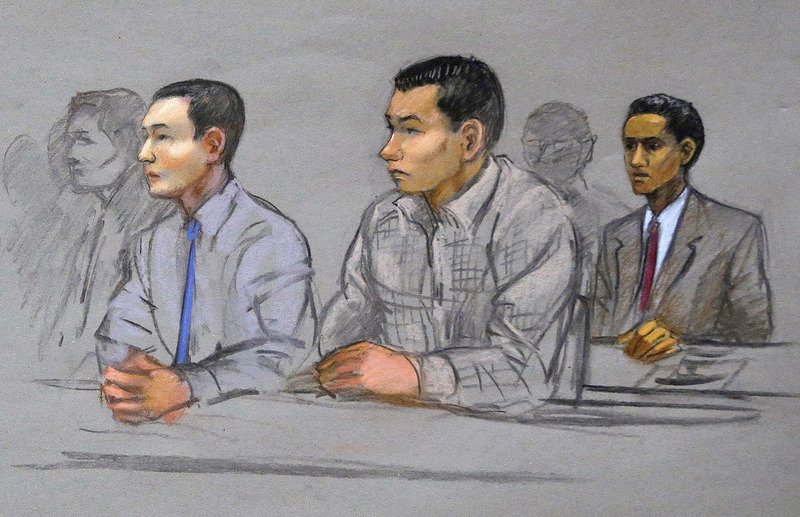 Azamat Tazhayakov, left, Dias Kadyrbayev, center, and Robel Phillipos, right, college friends of convicted Boston Marathon bomber Dzhokhar Tsarnaev, sit during a hearing in federal court in Boston in May 2014. Three friends of Dzhokhar Tsarnaev were sentenced to jail terms after they were convicted of obstructing the investigation into the 2013 bombing of the Boston Marathon. Authorities said that Azamat Tazhayakov, along with another Tsarnaev college friend, Dias Kadyrbayev, conspired to dump Tsarnaev's backpack, which contained fireworks that had been emptied of their explosive powder. Tazhayakov was sentenced to 42 months in prison. "Tazhayakov has already served about two years of his sentence. He's expected to deported when he's released from prison." Kadyrbayev was sentenced to six years in prison for the backpack incident and for failing to call police when he recognized Tsarnaev as the marathon-bombing suspect. A third Tsarnaev friend, Robel Phillipos, was sentenced to three years for what the judge said was creating a "substantial diversion" of law enforcement resources, according to The Associated Press. "Robel Phillipos was convicted of lying to the FBI days after the bombings. Former Massachusetts Gov. Michael Dukakis, a friend of Phillipos' family, wrote a letter of support for him and even testified during his trial. "In the letter to the judge, Dukakis wrote that he "can't understand why justice would be served by incarcerating him."